Our serene spa offers an array of treatments and therapies in an inviting atmosphere. Whether you wish to feel relaxed, rejuvenated or energised, The Little Spa will restore your senses, imparting unparalleled balance and harmony. 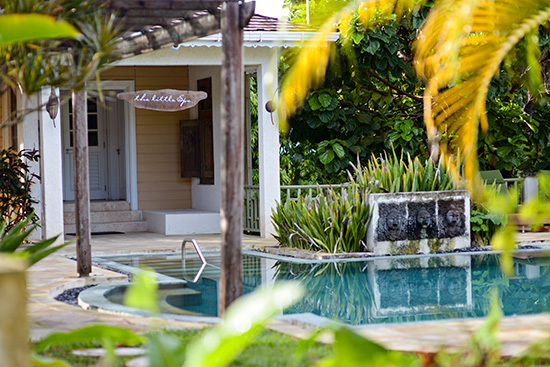 The Little Spa is a serene retreat for healing and renewal, located within the lush tropical gardens of Little Good Harbour. Adjacent to an inviting swimming pool lined with cushioned sun loungers and shady cabanas, it offers a variety of pampering treatments.including sumptuous massages, rejuvenating facials, soothing wraps and invigorating scrubs. Expert waxing services, spa manicures and pedicures are also available. The Little Spa offers special packages including a signature full day package; we are also happy to arrange custom packages for couples, friends or special occasions. Advance reservations are recommended; in-room services are available on request.